At the young age of 13, Rylie Maedler has accomplished more than most of us have midway into adulthood, writes Zachary Zane. 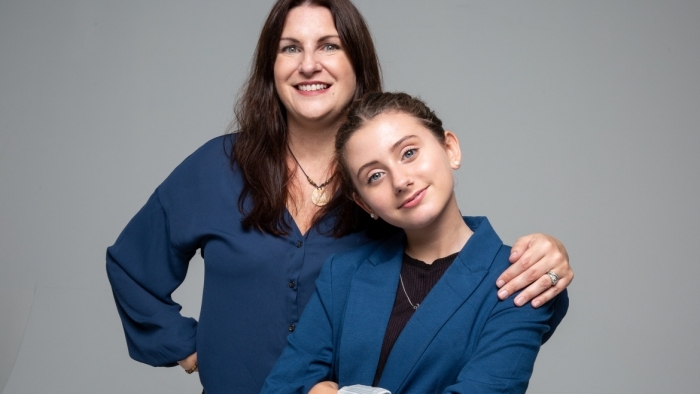 Not only is this teenage powerhouse the CEO of her own CBD production company and research foundation, but she also has helped pass three cannabis laws granting CBD to children under 18, gives talks at cannabis conferences across the world, and has found a way to live a healthy life, despite having one of the rarest and most debilitating diseases on the planet. While the word “inspirational” is grossly overused, there really is no other word to describe the young cannabis activist. Rylie initially tried CBD under troubling circumstances. Shortly after her seventh birthday, she swallowed a tooth. Within weeks, all of her teeth became loose and many more began to fall out. Rylie was initially ecstatic, thinking she was about to earn some cold, hard cash from the Tooth Fairy, but her mother didn’t share the same enthusiasm. The doctors informed Janie Maedler that her daughter had Aggressive Giant Cell Granuloma (AGCG), an extremely rare degenerative bone disease that mimics bone cancer and causes tumors to eat away at the bones. Given the tiny prevalence of the orphan disease — it affects a mere handful of people worldwide — limited research has been conducted on the illness. Typically, AGCG is treated the same as bone cancer, with either chemotherapy or daily calcitonin injections. Janie didn’t want to go that route with her young daughter just yet, so against the law and the doctor’s orders, she decided to administer CBD oil to Rylie after reading online that it could help with tumors. Within three weeks, Rylie’s bones began regenerating (in fact, she's the only recorded AGCG patient in the world to have her bones grow back). Today, half a dozen years later, Riley is completely healthy — as long as she takes CBD daily. Since discovering the wonders of CBD, Riley became a prominent cannabis activist, having assisted in the passage of three measures in her home state of Delaware. First she helped pass Senate Bill 90, a.k.a. "Rylie’s Law," which allows children under the age of 18 to use medical marijuana-based oils to treat intractable epilepsy and dystonia. Shortly after having a law passed in her name, the young activist passed two more laws. The first allowed students to consume CBD on school campus and the second allowed children with autism to take CBD. Before the school campus bill passed, Rylie had to go through a number of cumbersome steps to take her medicine on weekdays. First, she had to be signed out of school. Then she walked off school grounds, in which she crossed a literal bridge. There she could take her medicine and then finally return to school grounds to be signed back in and attend class. The next law she hopes to pass would allow school nurses themselves to administer CBD to students, which, at the present moment, would be illegal. Luckily Rylie’s dad works at the school and is able to administer the medicine to his daughter daily. In addition to her already established career as a lobbyist, last year Rylie founded and became CEO of Rylie’s Sunshine, a development company that produces and sells CBD oil. Rylie’s Sunshine works alongside her already established foundation, Rylie’s Smile, which she and her mother spearheaded roughly five years. Rylie’s Smile researches specific cannabis recipes for various debilitating pediatric illnesses. The recipes they create are then used in clinical trials to test the efficacy. She says she decided to research and sell CBD oil because she wanted something the actually worked. “A lot of times, I had medicine from these places that contained, like, mold, and they would give me more seizures," she said. "They were also very expensive. I thought I should make a company so kids would be able to get medicine affordably." The research component of Rylie’s Smile focuses on the impact CBD can have on a number of diseases, including Lyme’s disease, degenerative bone diseases, secondary osteoporosis, autism, and even skin grafting. In fact, one young boy who was run over by a lawnmower, has undergone 48 skin grafting procedures through the foundation. Despite all of her incredible work destigmatizing cannabis, researching CBD as an effective, alternative treatment, and advocating for medicinal pediatric use, Rylie still faces numerous challenges in school. After concealing her CBD use for a year, she decided to come out about it. While most of her schoolmates' parents were supportive, some tried to keep their kids away from Rylie. A few weeks ago, Rylie encountered another challenge. Her school health department started their “drugs are bad” spiel, sharing videos that not only stigmatized all cannabis users, but spread blatant misinformation about the plant. “It made Rylie feel awful and that she was dumb and doing something bad,” her mom explained. So the next day Rylie and Janie spoke to her teacher who apologized and felt “terrible” about some of the comments she had made without considering Rylie’s situation. While screening the video is still mandatory curriculum, the educator promised she’ll be more sensitive next time when discussing cannabis. Rylie and her mom are are working to help update the curriculum to reflect modern research, as well as the numerous benefits cannabis can offer people of all ages living with a range of mental and physical ailments. With her small stature and adorable smile, Rylie has become a fierce advocate for cannabis, seemingly able to overcome every obstacle put before her. Cannabis allowed her to live a normal life, and surely, as she continues to age, she will keep doing everything in her power to help others like her discover the myriad of medical uses for what some believe is a miracle plant.